In 1935, NBC brought Broadway and Jimmy Durante to radio listeners across America with its Jumbo Fire Chief Program. The radio program was based on Billy Rose’s Jumbo which told the trial of the John Considine Wonder Show, a circus having to dodge attempts by a U.S. Marshal to sell off the show to pay off back taxes, which the circus owed due to its overzealous promoter, Claudius “Brainy” Bowers (Durante) who overstated the show’s profits, thus bringing the government down on their back. The music was provided by no less than Paul Whiteman and his Orchestra, carried its own glee club–Charles Henderson’s thirty-two Razorbacks, featured acrobats, a full complement of clowns, a 35-foot tall puppet, animal acts and in the final scene of each performance featured Jimmy Durante allowing the 8,000 lb. Jumbo to place its foot over Durante’s head. Indeed, the only venue then available in New York to house such a production was The Hippodrome, a 5,000 seat theatre with a 60 foot high ceiling. The program ran for 233 performances and the high cost depression-era show ended up losing $2.4 million in 2012 Dollars (per Digital Deli). The Broadway Show ran from November 1935 to April 1936, while the radio version ran from October 1935 to January 1936. The radio show features most of the songs from the Broadway show and a few more in the 12 episodes run. The music was wonderful to listen to. The highlight of the show was a “young” Jimmy Durante. Young is in quotation marks because Durate was 42 going on 43 when the radio show began. However, Durante would keep working until he was 80. Durante had the malapropisms and all the Durante style of humor working. The package was much more vaudevillian than later Durante performances. The performance was part of Durante’s rise to prominent. He was eight years away from becoming an entertainment elder statesman which he would do when at age 50 he was teamed up with 28 year old Gary Moore on their joint radio program for Camel Cigarettes and then for Rexall. This particular series though was one case where the whole was not greater than the sum of their parts. Durante’s vintage acting, the Rodgers and Hart music went nowhere. The program illustrated the peril with trying to adapt a two act Broadway play to a twelve part radio series. Each episode would go the same way: There would be an opportunity to save the circus but Brainy Bauer’s efforts would ultimately backfire, but at the end of the episode the Circus would get a stay of execution until next week. In the middle of that, the two young love interests Mickey Considine (Gloria Grafton) and Matt Mulligan, Jr. (Donald Novis) would work in a love scene and a song. Perhaps, Billy Rose wanted to avoid revealing the ending, but it left a kind of thin plot. 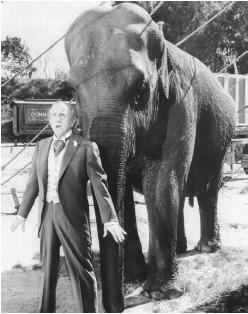 It’s worth noting that a reworked version of Jumbo did make it to the screen in 1962 with Jimmy Durante playing the owner of the circus and in most other ways acting the same part he played on the radio and Broadway. As for the radio series, if you can get past the then plot, then the music, Jimmy Durante, and just the age of the recording make this a well worthwhile series.